Despite reports of its imminent demise, it would appear that reading is very much alive as we prepare to exit the first decade of the twenty-first century. While the advent of electronic ‘readers’ has been cursed by some as the end of books – and in a few extreme cases, civilisation – the reality is that the new reading platforms may in fact be the re-launch that many books have been waiting for. The trend is only likely to increase in 2011 as Google brings its eBooks to the UK. Already operating in the US, Google eBooks will work in tandem with the new Google eBookstore which has more than 3 million books available. Uniquely, it would seem, Google eBooks are designed to be ‘open’, meaning that they are compatible with a range of devices from netbooks to smartphones to tablets and e-readers. You can buy, store and read Google eBooks in the cloud. Which means you can access your ebooks like you would messages in Gmail or photos in Picasa – using a free, password-protected Google account. 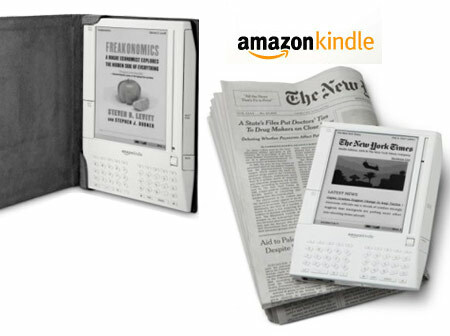 Personally, I don’t own an e-reader yet, but I’m guessing it’s just a matter of time. I do know someone, however, who needs to read like most of us need to breathe, and her relationship with her new iPad has been a revelation over the past few months. Already they are inseparable. Apart from the obvious advantage of all her books in one place, the sharpness of the text, the clean lines of the device and the built-in dictionary are all part of the general appeal. 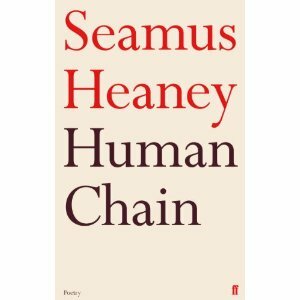 She did appreciate though, on Christmas morning, a beautifully wrapped, crisply-new, paper and card, touchy-feely copy of Seamus Heaney’s Human Chain. Books aren’t dead. We’re only discovering new ways to deliver them. This week I became aware of two very different projects whose purpose is to spread literacy and reading to those who might otherwise be overlooked or neglected. The first of them is the brainchild of the so-called ‘bad boy of books’, Jamie Byng, second son of the 8th Earl of Stratford and managing director of Edinburgh-based publishing house Canongate. 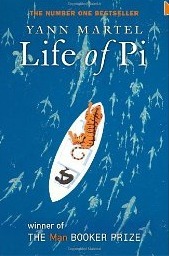 Byng rose to fame when, after joining Canongate as an unpaid volunteer, he bought the company from the receivers, before persuading the little-known author Yann Martel to let Canongate publish his novel Life of Pi. The following year it won the Man Booker prize, earning Canongate millions in the process. 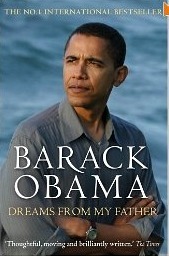 Further success was to follow when he bought the rights to two books by the little-kn own Chicago lawyer Barack Obama, and the rest, as they say, is history. Byng’s latest idea is World Book Night – March 5th 2011 – when 20,000 members of the public chosen from applicants to the WBN website will give away 48 copies of their favourite book chosen from a list of 25 titles. Potential ‘givers’ are asked to describe how, and to whom, their books would be given, and preference will be shown to those who promise to reach the most needy. With traditional publications under threat from Kindle, iPads and ebooks generally, Byng is presumably hoping that the great giveaway will encourage people to go out and buy more books. I’ve already submitted my application. Around the same time as I was completing my online application for World Book Night, I received an email from Ruby Veridiano of Litworld, a not-for-profit organisation which does some amazing work in promoting literacy in some of the poorer areas of the world. 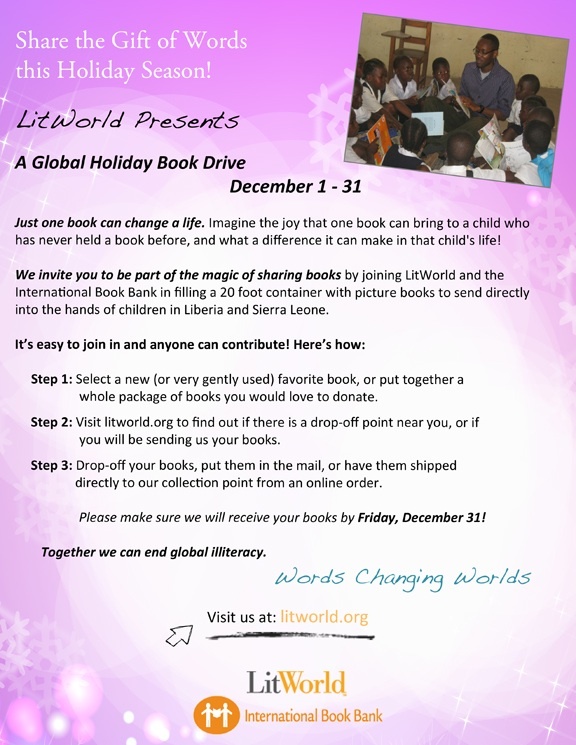 For the month of December, Litworld’s focus is on their annual Holiday Book Drive, sending books to Liberia and Sierra Leone, where most children have never seen, far less owned, a book. The idea is simple: people donate children’s picture books, sending or bringing them to one of three drop-off points in New York. LitWorld, in partnership with The International Book Bank, will fill a 20ft container with the books (around 3,000 are needed) and ship them to Liberia and Sierra Leone. There, the books will be put straight into the hands of children. Some of these children will never have seen a picture book before; normally, on average, one book is shared among 75 children. Two very different projects with a common aim. Support them if you can. Some time ago I wrote a post about handwriting, and whether it still matters nowadays (you’ll just have to read it here to find out what I said!). The other most commonly asked question of a literacy adviser, and probably of anyone in language education, is whether spelling matters anymore. My answer to that one is, that although context and purpose vary its significance, generally speaking YES it does. Of course we are all capable of making mistakes, and sometimes we are in a hurry, and sometimes we can’t be bothered to check it over, and sometimes it was just a note-to-self anyway, and……you get the idea. There are no easy shortcuts to being a competent speller, and it is more difficult for anyone with specific learning difficulties such as dyslexia. However, as long as we are going to communicate in writing, the more accurate the spelling the better, and less room for ambiguity. There are quite a number of myths out there regarding spelling, including this one which has been in circulation for so long it has become an unchallenged ‘fact’. Hope you enjoy its de-bunking as much as I did.